We love space-saving workspaces, especially when they offer lots of storage. While Joe and Brad's bookshelf workspace runs wide, it doesn't take up much of the limited space available in their apartment. 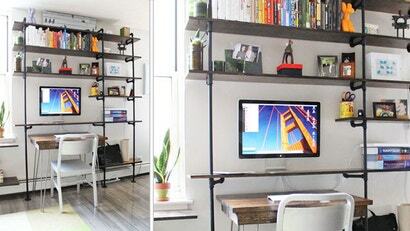 The large, skinny bookshelf is a DIY project made from pipes and board (rather like this one or this one). The desk unit was created from an IKEA LAGAN worktop and hairpin legs. This is a simple, attractive setup that anyone with a few DIY skills could put together themselves.